Various inventors in multiple countries had been experimenting with typing machines in many forms for many years by the time Christopher Latham produced the first version of what would become recognized as the modern typewriter in 1867 (Dugan). His prized machine would later evolve into the various incarnations of the famous Remington branded typewriter. The early typewriters had many obstacles to overcome before becoming commonplace in offices and homes in the 1930s. The largest obstacle to be overcome wasn’t economic or technological, it was social. People did not like the idea of typing on a machine when they had been writing by hand their whole life. (Monaco 214) All sorts of cultural norms and etiquette were threatened by the typewriter. Even the United States government was opposed to typewriter usage due to the bureaucratic issues that it would impose as a result of all the prior rules requiring document usage, storage, transfer and maintenance to be done by hand. One of the most important social influences the typewriter had on the modern world involved women in the workplace. During the end of the 19th century and into the 20th century, women began to flood into offices along with typewriters (BBC). Typewriters were actually marketed towards women, with advertisements featuring smiling, independent women in the office. Until this point in history, men had hired boys at cheap rates to do tedious work like typing and filing. The boys however still required supervision. Women were able to be hired and trained to type for cheaper than a grown man and could work independently. Women were valued for their attention to detail and organizational skills, something the younger boys also lacked (BBC). The first female typists were called “type-writer girls” and were at first kept separate from the men in the workplace. Separate bathrooms, break-rooms and offices were provided for them. Work conditions for the women were typically poor. Their rooms often had very little ventilation, lighting and space. Their hours were long and wages were low (BBC). Though the typewriter provided a strong foothold and entrance way into the workplace for women, it did not provide equality. Eventually the superior speed, neatness and potential of typewriters was realized and the appearance of documents was transformed forever. Once the initial skepticism was overcome people actually became deeply attached to their typewriters, custom painted options were offered and rare models collected (Dugan). The machines themselves became personal and considered works of art despite the association of early models with bland, bulky and utilitarian appearances. Legible documents were able to be quickly created, copied and distributed allowing for massive improvements in efficiency and organization. During the typewriters era, letters were the main way that social, commercial and fiscal communication was sent. By allowing for letters to be typed, the spread of information was able to drastically increase. Typing or keyboarding classes were offered to train typists and to maximize potential efficiency (Monaco 215). The shift key on a modern keyboard actually came from typewriters where it worked to “shift” the baskets of keys from their uppercase to lowercase versions. Since holding down the shift key meant physically raising a basket which was fairly difficult for longer sections of text, the “caps-lock” key was invented to hold the desired basket in position (Daskeyboard). Typewriters are also responsible for the now standardized QWERTY layout of keyboards. This format goes all the way back to the first Remington’s that were produced (Dugan). Bonus fact: February is actually national typewriter month. Monaco, Cynthia. “The Difficult Birth of the Typewriter.” Harvard Business Review, vol. 67, no. 2, Mar/Apr89, pp. 214-215. EBSCOhost. Nienhouse, Tyler. 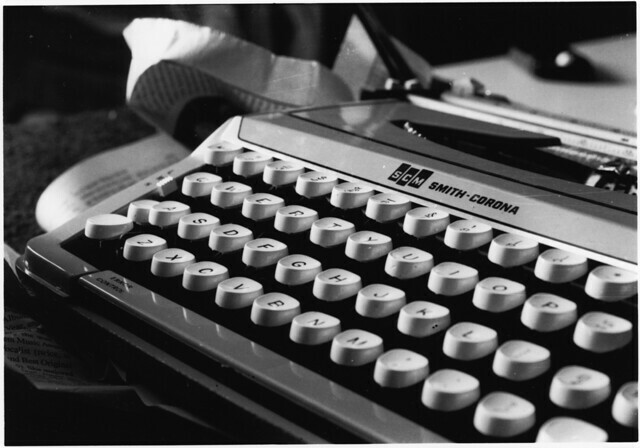 Still Life (35mm) – Typewriter. 2010. Flickr. Web. 22 Feb. 2017.